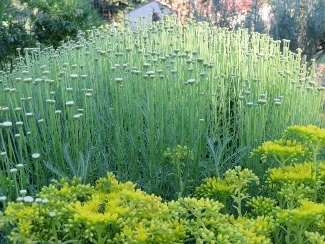 Joy Creek Photo Archive (c) all rights reserved Santolina chamaecyparissus 'Lemon Queen' drapes over the wall of our Texture Garden in a dense mass of fine silvery gray foliage. Customers love to brush the aromatic leaves of this small shrub. The composite heads of pale yellow flowers complement the silver. Mid- to late summer. 20 in. x 36 in.